In which I click the shuffle icon on the increasingly frustrating iTunes app and listen to the first five songs that pop up from the years 1976-85. A catchy disco tune with a strong "four-on-the-floor" beat and typical disco lyrics: "Get up and dance, got ants in your pants." Frantique was a three girl group from Seattle that produced this song in France but somehow ended up on the Philadelphia International label. I'm surprised this one didn't make a dent in Billboard's Disco charts. An album cut from Adams' Cuts Like A Knife album. As album filler, it's not bad, but it sounds labored and ends poorly. Reminds me why I mainly listen to side one of that album. A bizarre pastiche of a track that leads off side two of the Outside/Inside album. Lyrically, it's a parody of the 1958 b-movie of the same name. Musically, its got everything from tribal drums and chanting, spoken word narrative, jungle noises, a horn break, and a capella choruses. All put together by producer David Foster (not his usual output, admittedly). Nonetheless, it's my favorite song on the album. As a friend told me not long ago, "Still not sure where Wongo is, but I wouldn't mind goin' there to visit the women." This Billy Strayhorn standard didn't need another remake, but this Ferguson arrangement, as you would expect, features a lot of high-soaring trumpet pyrotechnics. Tasty trombone solo. Brief, but enjoyable. Fantastic SoCal New Wave. Loved this one since I first heard it in the movie Valley Girl. I later picked up the whole Convertible Music album which was a smart move indeed. I only picked up Convertible Music a few years back but it is good stuff. Both of Josie's early albums are solid. 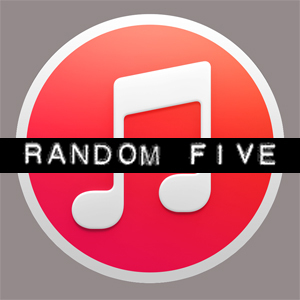 More random shuffles... er random fives, please.